One of my favorite weight loss topics to talk about is infused water! They are known to naturally boost metabolism while making the whole drinking 12 glasses of water a day process a bit more fun. They are not at all expensive and have almost 0 calories in them. That's just so great! I first started making them back in April 2014 and it just instantly refreshed me. I tried probably the oldest mix: Lemon, Cucumber and Mint. Saying that then I moved on to strawberry and mint and then now I drink the one with Orange and Mint. I love mint because it gives me the necessary kick to start the day. You can make one by just cutting up the mix of your choice, mixing it in a whole bottle of water and then just refrigerate it overnight or however long it works for you. There are now different infusion pitchers available too but I just find them a tad bit on the pricey side. 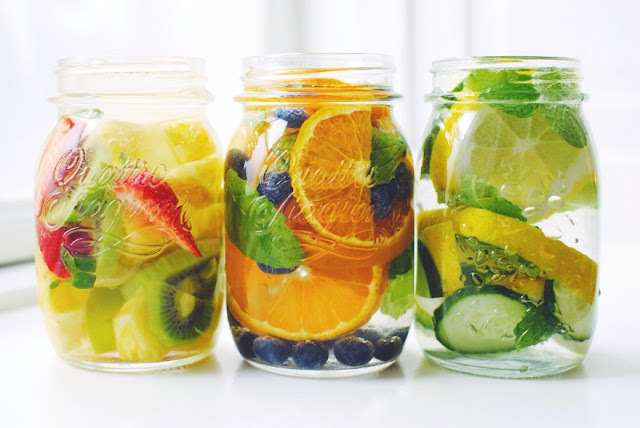 Have you ever tried Infused Water? Share your recipes and experiences about it with me in the comments below. I really enjoy infused water, but I tend to stay classic with lemon and mint or lemon and cucumber.